Robo Copy is a vending machine for printing, copy and scanning. It supports connection to USB devices and is operated with touch-screen monitor. • Library – forms, document templates, tourist maps and guides etc. Robocopy is equipped with user-friendly internet-monitoring system accessible from personal computer or mobile device. You can always keep yourself up to date about the latest statistics of each machine you own. Within one button click you can always find out how much paper and toner is left in printers, if there was a blackout, an error as well as daily and monthly income of each Robo Copy. Paper storage: 10.000 sheets, Paper treys: b/w: 1500 sheets – color: 150/250/500 sheets, B/w cartridge capacity: 12.500 copies, Color cartridge capacity: 2000/3000 copies, Ambient temperature: 10-32 °C, Humidity: 20-80%, Power supply: 220 – 240V, 16A – 115 W, Dimensions: 184x80x72 cm, Weight: 195 kg. Gr Vending imports and distributes in Greece, a whole set of leading products, including the most efficient and advanced payment systems, innovating vending machines for food, snacks, drinks, cigarettes and last generation telephone products. 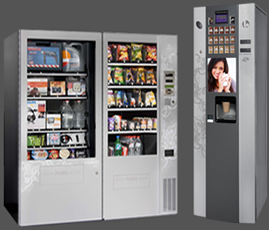 Our vending machines range allows you to offer to the public the most diverse products choice, not only snacks or drinks but also such products as cigarettes, hot food, ice creams and frozen products, oversize products or any other product a customer may demand on any sales point. Our payment systems are the most advanced systems for coins, notes and cashless cards and they ensure top security and performance, total compatibility with machines and a centralized technical service. Our top quality public telephony systems can be installed outdoors or indoors.